Comments: Happy 2nd birthday Laytyn!! Comments: Happy birthday, Jordan...and belated birthday wishes go out to Laytyn!!! (I'm a new member!!) Have a wonderful birthday!!!!!! Comments: Jordan, just stopped by to wish you a Happy Birthday. Hope you have a great day!!!! Comments: Just popped in to wish Laytyn a very Happy Birthday. I hope that you had a wonderful day and got to be with all your friends and family. I hope you will stop by sometimes and visit my website. Comments: Popped back in to say Happy Birthday to Jordan!! Comments: Popped in to wish you a very happy 2nd birthday!! Comments: Happy Birthday Jordan! Hope you have a wonderful day! Comments: Hi Laytyn! I just wanted to drop in and wish you a wonderful birthday!!! =) I hope you enjoy it very much! Comments: Laytyn - Happy birthday!! Best wishes on your special day! Website: Enter if u dare!!!!!!!!! Comments: Just popped in to wish Jordon a happy birthday! Comments: Happy 2nd Birthday Layton!! Comments: Hi there! Just wanted to wish you a very happy birthday and hopefully many more to come! Love your site, you did a great job! Keep up the good work!! If you have time, stop by and check out my site! BYE!! Comments: I like your page. Keep up the good work. I will be back soon. Happy birthday Jordan. Hope your day is special. May all your dreams and wishes come true. Comments: happy birthday laytyn & jordan! have a great day on your birthday! Comments: happy birthday laytyn! have a great day on your birthday! Comments: Didn't see that there were two birthdays happening at your place! Have a great day on the 7th, Jordan! Comments: Happy Happy Birthday Jordan!!! I hope all your wishes come true, from the Birthday Club!! Comments: Happy Birthday from this little angel to a little angel who's 2 today!! Comments: Happy Happy Birthday Laytyn!!! I hope you have a great Day!! Comments: Hi Laytyn,I just stopped by to wish you a very Happy 2nd Birthday. I hope you have a wonderful day and get lots of presents. Try not to make to much of a mess with your cake !!!! Have a great day on Oct. 3. Comments: I didnt see that there were two of you that were haveing a birthday. So HAPPY BIRTHDAY JORDAN!!!!!!!!!! May it be a great one with many more to come. Comments: Happy second birthday Laytyn!!!!!!!! Comments: Happy Birthday now & every year! Comments: Happy birthday Laytyn. Dont give mom too much trouble when you turn two. Hope its a fun one. Comments: Truly an enjoyable visit here at your home on the Web. Fantastic job. Please visit my home on the web and sign my guestbook please while you are there so I know you were there. God is so Good all the time. I am glad that I know Jesus as my Savior. I am glad you allowed me the priviledge of visiting your site today. Keep up the great work for Jesus. May God richly and abundantly Bless every aspect of your life. Comments: WOW so much to see and do - I have bookmarked it so that I can come back again later. take care cos I care. Drop by and apply for an award. The love and hard work you have put into it makes the net a better place! We bring forth our shiny badges with all our might. Comments: HI Adrienne! thank you so much for signing my g.b. and wishing me a happy birthday... I enjoyed visiting your site. Keep up the great work.. Comments: Hello Adrienne!! How nice to meet you!! Your site is wonderful and I particularly enjoyed your "My Hero" page!! Comments: I REALLY ENJOYED MY VISIT HERE. Comments: Hi Adrienne, This is Becky (webring manager for HHWR) Wow! I have not had the chance before to look at all your pages. OUTSTANDING!! You have bunchs of people you pray for too! You should be a Annie's Email Encourager! I can see your love for the Lord and for people in your pages! Comments: You have a very lovely "home"!!! Comments: Hi Adrienne! I love you site. I am on my way through the treasure hunt for the second time and enjoying this time much more! 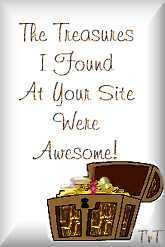 I wanted to thank everyone for sharing their sites with the rest of us treasure hunters. Comments: Thank you for participating in the First Annual "Random Acts of Kindness Scavenger Hunt" 1999. Thanks to all the participants, the hunt was a HUGE SUCCESS!! We couldn't have done it without you!! Comments: I found you through LOTH. You've done a great job here! keep it up! Comments: wonderful pages. keep up the good work!! Comments: You have a beautiful webhome here. I really enjoyed my stay. Thanks so much for inviting us here on the "Hunt". Comments: Hi Adrienne, I missed signing your guesbook yesterday during the hunt so I am backtracking to visit everyone whom I missed and perhaps see a little more of your cyberworld. Your pages are wonderful .. Hugs. Comments: I have been your Secret Summer Sister. I can see by your web pages that you are an expert! These are very nicely done and I have loved looking at your wedding photos! Comments: I really enjoyed my visit today -- especially your holiday pages -- what wonderful graphics! I'll be back to look around some more soon, but wanted to let you know I had stopped by :-) Hugs from a LOTH sister -- Marie. Comments: You have a very interesting website. I enjoyed my visit very much. Please come over and visit my site. While you're there don't forget to "sign in please". Comments: you really need to learn html. Comments: Greetings loth Sister!! You have a beautiful home here on the web..Please,come and visit me anytime ,and I sure have enjoyed my visit. Please come and pick up a gift! Comments: Hello there Adrienne, I just wanted to say thanks for all the work you do for the Birthday club ring, hey also you had Hubby are a great looking couple. Comments: I sure like your page and I hope you like mine. Play some games while you are there. Comments: Hi I love your holiday pages, especially Halloween. Beautiful graphics! I love animated graphics. Do you know of any sites that offer free animated graphics that are not so generic?? Please visit my site and let me know what you think. Bye!! Comments: You have a beautiful site here! I have really enjoyed my visit, there is so much to see, I will be back. Thanks for sharing. Comments: I just love your page! The graphics are beautiful and the whole page is just FUN! Keep up the good work. Hi Adrienne! I read your posting in Tidbits and had to come visit. Congratz on your new position. I will keep you in my thoughts and prayers. I am sure you will do great! Your pages are fun and enjoyable! You have done a lot of work on your site and it shows! May God smile sweetly on you! I invite you to visit my site featuring free background sets and browse through my poetry and stories. Comments: Congratulations on your new promotion! *S* Saw your post to Tidbits and thought I'd drop in and take a look around. You have a very complex site. I will come back to visit when I have a little more time. I would really like to look around more. Comments: Hello LOTH Sister..wanted to drop in ..I love your site! Keep it up! Comments: Thanks for the birthday greetings CaliLOTH sis :o) Lovely page you have here! Comments: Adrienne, HI from your LOTH Buddy! I just wanted to stop by your page and drop you a line. You have a great page! How come you have so many LOTH gifts? :-( I've only been a member for about a year now, and have only had a web page for about 9 months, so I'm kinda behind everyone else. Come visit me sometime. God Bless. Comments: Great site you have. Enjoyed my visit. Comments: Hi thanks for coming by and wishing me a happy birthday! I found you in LOTH Tidbits and stopped by to say hello. I enjoyed my visit to your webhome. Comments: Greatings LOTH sister. I think that I may have signed before but I could not find if I had or not, so I wantded to let you know how great your site is. You have done a wonderful job on it!! Comments: Hi, your site is so cool! I like it very much, please visit me and don't forget to sign my guest book! Comments: I saw your post in tidbits, I am a fellow LOTH member....your site is great!!! I have it bookmarked to visit again....it's huge lol! Comments: Hello Adrienne! I was reading the LOTH tid-bits and saw your site listed in the messages so I thought I'd come by and visit. You have a wonderful site and I enjoyed my time here very much. Do come by and visit HomeMadeInc some time. Blessings! Comments: Greatings LOTH sister!! LOVE YOUR SITE!! I've enjoyed my visit to your site. You've done a great job on it. Keep up the great work! Warm Smiles. Come visit my pages, I just love to have visiters!! Comments: Thank you so much for the Birthday wishes that you left in my guestbook! :) You seem to have a great page here and I hope to come back soon to explore. :) Thanks again! Comments: Cute page! I really liked it! Comments: Hi there! I was just browsing throught he RAOK newsletter and your site was being featured so I thought I'd stop by for a looksie :-) It looks wonderful..keep up the good work! You should think about entering it in the Rumbles. Check out their page and see if you would be interested. Talk with you soon! Comments: Hi there. I was just looking over your beautiful site here. It is really good. Congradulations on being in the Spotlight!!! Comments: Hi! Thank you for coming to wish Cameron a happy birthday! He really enjoyed it!! Comments: I enjoyed your site. Keep up the good work. I will be back soon. Thanks for wishing me happy birthday. Thanks for the balloon picture too. Comments: Enjoyed your site. Visited your mother's day page. I can see why you got the award. Come over and visit the Korner sometime. See you there. Comments: Hello from Denmark. What a lovely site, great job you have done with your homepage, I enjoyd my stay, I will definitely be back to visit again." ~ Mogens"
Comments: Hi Adrienne!I came to your site through your Easter Page which is lovely and explored a little from there. I didn't know you could adopt so many things on the net!Thank you for your site. Comments: I have enjoyed my visit here very much. You have done a great job. Hope you have a great day. Comments: Hi! Your page looks very nice! Comments: Thank you for stopping by. You have a very beautiful site with lots to see and the pages show you have spent much time on them. Comments: Great page. It is alwasy nice to meet a LOTH sister and find out about her. Comments: Adrienne hi from a fellow member of LOTH. I really like your site! Drop by and with my family at Our Little Site on the Web some time. Comments: Hi Adrienne: I am a LOTH sister, just stopped by to check out your lovely site. And the page that you made for your niece Laytyn is just adorable. And she is so cute in that pumpkin. Just loved it. Thank you for sharing. Comments: Hi Adrienne. Thanks for dropping by my site and signing my guestbook. I love your site and have a great visit here. Comments: Dear Adrienne: I'm a LOTH sister of yours from Brazil. Last year I wrote you ashort message asking to you what virtual jail was (remember?) [giggle] Now, I want to thank you for inviting us to this beautiful page ofyours. I really loved being here. All my love to you, simone. Comments: Hi Adrienne ! What a wonderful website you have!! I really enjoyed your holiday pages!! Comments: I really had fun with this contest. Great site. I enjoyed every minute of it. Thanks for a little beauty in this world. Comments: Hi, interesting site! I enjoyed surfing around it. I think there must be a lot more to it than I found so far though - I'll check back again and see what else I can find! It sure had made my day! Comments: Thanks for the birthday wish. Comments: Hi! Cool site! I esp. liked the Netiquette page! I thought it was cool how you met your husband! Keep up the good work! Celebrate Random Acts of Kindness Week Feb. 8-14. "Kindness is the golden chain by which society is bound together." -- Johann Wolfgang von Goethe. Comments: I am planning a baby shower for a very dear friend. I've never given a shower before and you have given me some great ideas. Thank you! Comments: I found your site through LOTH. And what a GREAT website it is!!! I have had a great time going through your pages, seeing and reading as much as I can. I'll be back soon! Comments: Hi, love your pages. I like to dance too. No competition, just for fun. Love the holiday pages. Come visit when you can! Your Loth sis! Comments: Thanks for stopping by. You have a great page. I enjoyed my visit and will be back. If there is any way I can help in any area, let me know. Thank you for sharing a part of yourself with me and with others. What a gift! Please visit me and sign my guest book. When you get there, please tell them Smokey sent you. Thanks. Comments: Hello Sister from LOTH! I thought I would stop by your site again and visit more pages... you've done a wonderful job with it! I would be honored to give you a few awards! I just joined RANDOM ACTS OF KINDNESS WEBRING. Just wanted to stop by and introduce myself. Am hoping to get to know the ring members. Please drop by my cabin for a cup of tea or coffee anytime. I hope to see you soon.Here you will be greeted by the Rainbow Playmates and find some interacitive fun as well. to spread just a little joy over the internet. Comments: Thank you Adrienne for stopping in and wishing me a happy birthday :) my mommy has been reading me all my wishes! you have a good day. Comments: Hi Adrienne! I loved visiting your site! Your wedding pictures were beautiful!! Thank you for visiting me and signing my guestbook!!! I love your site! You have a lot of neat stuff here, I especially loved the romantic story of you and Paul meeting. Thanks so much for everything you did as my Secret Santa. Take care! I've enjoyed visiting with you very much. Comments: Hi Paul, we came by to wish you a very happy birthday! We hope that it's the best one ever for you and that all of your birthday wishes come true!!! Comments: Just wanted to stop by and wish you a Happy Belated Birthday. Wonderful page you have here. I bookmarked it so I can come back after the holidays and check it out. Comments: Happy Birthday Paul! Hope your day was wonderful! Comments: Happy Birthday, Paul!!! Your guys' page is really spiffy! Keep up the good work! Comments: Whooops! We were just surfing around your pages (okay, our mom was, grin) ... and we signed the guestbook on your wedding pages to wish Paul a Happy Birthday, but when we viewed it, nobody else had left birthday wishes, SOOOO, we came back here to do it again! HAPPY BIRTHDAY PAUL! Comments: Happy Belated Birthday Paul! She's right, you are a cutie! Hope you had a good time on your special day. Comments: Sorry we missed your Birthday Paul, but we hope it was a good one :) You and your family have a Very Merry Christmas!! Comments: Hi Paul! Happy Birthday! Hope you are enjoying your special day!! Comments: Hi there! Just got an email saying it's Paul's birthday soon. We just wanted to wish him a happy birthday! Great site, we enjoyed it! Comments: Have a Blessed Birthday!!!! Comments: Happy Birthday Paul!!!! I hope that you have a wonderful day today. Comments: Hi LOTH sister. I have had a wonderful time at your site. So much information. You've put it all together really well. And so many wonderful causes you support. Bless you!! I also enjoyed the many links. Thanks. Comments: Paul - Happy birthday!! Hope today is a special day for you! Wishing you all the best! Comments: Happy Birthday Paul. Hope you have a Great Day. Best Wishes from The Sforza Family. Comments: Just wanted to wish Paul a very Happy Birthday! Comments: Happy Birthday Paul! Hope you have a great day!! Comments: Paul, Happy Happy Birthday to you!!! I hope you have a fantastic day and a super fun-filled year! Comments: I think I have been here and all ready met the two of you before ;) Happy Birthday to Paul though! I hope he has a great day! followed by a complete YEAR of happiness! Comments: Hi Paul, dropped by to wish you a very Happy Birthday for the 9th. Hope you have a great day. Comments: Hi, Just wanted to stop by and wish you a very good Birthday on the Dec. 9. I hope you will have a wonderful, love filled day. May God bless you now and in your future too. God Bless, Gail May you always have an angel on your Shoulder and love in your Heart. Please come by and check out my Webpage and sign my Guestbook too. Comments: Hi there! As a young (3 1/2 years old) member of Tina's Birthday Club Ring, I'd like to wish Paul a very happy birthday! Hope you have a good one! Comments: Came to wish Paul a happy birthday! May you get your wish and have any more wondeful birthdays to come.